Polly Barendrecht, Occupational Therapist, tells us why creative play is important for your child's development. Creative play is a really important part of childhood development. Whether it’s drama, music, dance or visual art, these activities help young children express themselves. Children might not always be able to explain their feelings but may find it easier to do this with paint, colour, mime or singing. As well as communication, creative play helps children develop their imagination, problem-solving, thinking and motor skills. School-age children are big enough to dress up in costumes and play with props to act out a story. Pretending to be someone else helps children see things from another point of view. 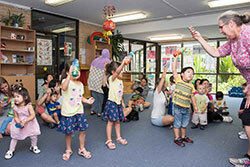 “Music can help children tell stories and it can lift their mood,” Polly said. Younger children will enjoy using everyday household objects to make musical instruments like rice in a sealed plastic container as a maraca or rubber bands on a tissue box to make a guitar. Older children will be able to start learning musical symbols and notes to play an instrument. “Doing art is a great way for children to develop their fine motor skills, including drawing, colouring, cutting and pasting,” Polly said. Using a range of objects like paint brushes, chalk, small pieces of paper, textas and things of different sizes helps children to develop eye hand coordination, and also the strength and coordination of the small muscles in their hand, which also helps with pencil grip and other skills such as tying shoelaces or doing up buttons. “Lessons can be useful as they are graded from easy to more difficult, combine fast and slow movements and provide lots of opportunity for movement”. The New South Wales Government has recently launched a voucher to help cover the cost of enrolment in creative and cultural learning activities. The Creative Kids vouchers provide $100 for every school-age child per year.